In the current landscape of musical theater, the need to stand out is becoming more prevalent. Setting yourself out from the pack, either through style or content, is increasingly becoming essential. After a long journey to Broadway, In Transit is an a capella musical that is a true love letter to New York. 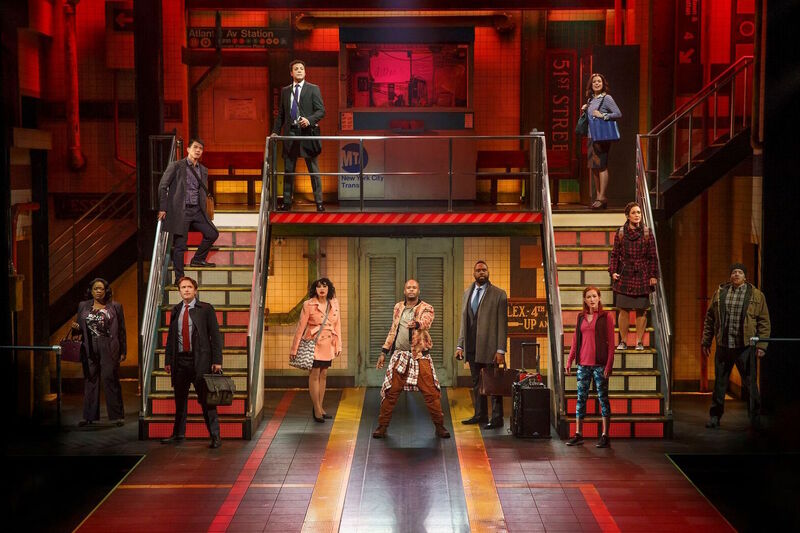 With book, music, and lyrics by Kristin Anderson-Lopez, James-Allen Ford, Russ Kaplan, and Sara Wordsworth, with original concept by Anderson-Lopez, Gregory T. Christopher, Ford, Kaplan, Karla Lant, and Wordsworth, In Transit is a fun, feel-good musical. And that's about it. 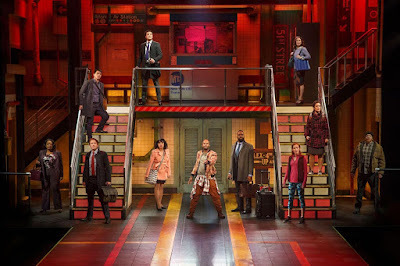 Following the lives of an assortment of connecting characters, In Transit celebrates the lives of New Yorkers and the trials and tribulations of the MTA. Essentially a "slice of life" musical, In Transit prides itself not on originality of story, but on the style of musical storytelling. But before we can talk about the achievements in a capella, the plot should be discussed. The almost perfectly connected stories follow Jane, an "aging" actress on the verge of her big break; her agent Trent and his fiancé, Steven, who are struggling to reveal the truth to Trent's mother; their mutual friend Ali who is hung up on an ex; and Ali's unemployed brother Nate, who just so happens to meet Jane at a bar. Sound too perfect to be real? It's New York. It's actually possible. But these intertwining narratives can go even further to connect. Audiences love when they pick up on clues. Even with redundant and predictable plot lines, they still managed to bring a smile. In Transit didn’t quite transport you to a place for escape, but instead brought you to an actual reality. With New Yorker insider jokes, the writers knew how garner a reaction. And it was a great cover-up for the simplicity of the story. As silly as the plot is, the draw is the ingenuity and bravery to present a completely vocal musical. With not a single instrument present, In Transit champions the power of a capella. A capella set to a known score tends to win an audience, but a new score? The odds are already stacked against them. And yet, they managed to triumph. But is it possible that more vocalists were needed? The score featured some great songs. And even with a cast of eleven, there were moments when Deke Sharon’s arrangements felt thin. The main cast doubled as “ensemble” vocalists but having a strict ensemble where the main characters didn’t have to double could have made the desired wall of sound fill the Circle in the Square. Music and lyrics are important, but with this genre of music, the arranger is the make or break factor. Sharon married the classic a capella style with the newfound rise of the “electronic” beatbox sound a la Pentatonix. By bringing old school a cappella with new school a capella, the music had a modern feel. In a capella, you’re only as strong as your bassist and beat boxer. They literally are the pulse of the sound. Thankfully, the beat was strong at In Transit. The deep-souled Nicholas Ward and the king of the beats Chesney Snow, who alternates with Steven “HeaveN” Cantor, filled the room with their sound. Snow’s beat boxing was sublime. Snow’s Boxman served as a spiritual guide for our weary travelers. His purpose was eerily similar to Street Singer in Brooklyn. The standout performance in the show came from the extraordinary Margo Seibert as Jane. Seibert struck a chord with all the aspiring artists and a high note with the show-stopping “Do What I Do.” The score fit Seibert’s powerful voice and paired with her charisma, she made Jane the authentically colorful person that we all know and, often, love. Former American Idol star Justin Guarini stepped up as Trent. Guarini’s character deified banality, forming a layered character. As Ali, Erin Mackey found a soft side to the jaded New Yorker. Her subtle hilarity was a knock-out. James Snyder as Nate felt out of place in this world. Snyder didn’t quite match the "bad boy" persona Nate needed. Director-choreographer Kathleen Marshall did all she could to make In Transit more than a fluffy musical comedy. Finding the weight in the material never quite happened, so Marshall opted for gimmicks. And they worked, some of the time. With the super-thrust stage and the conveyer belt track, Marshall naturally played upon the linear lines. It did cause some lack of variety, but her staging and choreography were consistent. Donyale Werle’s set was a nice blending of modern and historic subway stations, and it created a sort of “every station” feel. It also gave lighting designer Donald Holder a world of opportunity to play with light. Holder found a balance of theatricality through the realistic lighting effects. The costume design from Clint Ramos provided a wonderfully clean, modern feel. He kept the frills at bay. That is until that insanely crafted MetroCard dress. While it lacked purpose in storytelling, it certainly was a triumphant look! In Transit is a fluffy musical that may not change the world, but it will certainly bring some happiness into your day. And sometimes, that’s all you need.